- Comment from The Horror Film & Screenplay Festival. "The way the story is written is hypnotic and captivating. The style of writing manages to instill that sense of horror into the reader with accurate descriptions of bloody and gory scenes. When a character feels an emotion, whether it is fear, disgust or wrathful anger, the reader can almost feel it too and that is a laudable achievement for the writers. All in all, even if it is a truly twisted tale, there is almost no doubt that people would enjoy a movie based on this script and it could even become a cult-classic over the years." - Comments from Feel The Reel. "THE FAMILY WAY: COMING HOME"
- Comment from The Superficial Gallery, See the full review. - Comment from Feel The Reel. See the full review. "THE FAMILY WAY: COMING HOME, directed by Shiva Rodriguez, will take you to the heart of the matter... or remove it, depending on how you look at it. The cinematography is excellent, much better than one might expect from a short, but this is no ordinary short: this is a prologue to a forthcoming piece that Shiva and D. Duckie Rodriguez hope to fund, and if their skill with this piece, and their combined history in horror is any indication, getting funding shouldn't be a problem." - Comment from Nightmarish Conjurings, See the full review.
" 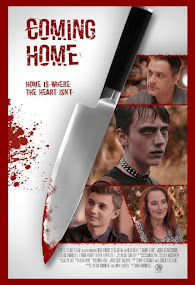 As such, while still not for the faint of heart, “Coming Home” stands as a worthy entry to the horror short film platform, and should certainly have the appreciation of an audience who is pining for something fresh." -Excerpt of review from One Film Fan. See the full review. - Excerpt of review by Dave Dubrow of The Slaughtered Bird. See the full review. Excerpt of review from Sick Flix. See the full review. "As a full film, "Coming Home" manages to get its point across in a decent, entertaining way. It's a fresh take on so many movies we've all seen in the past... and that "freshness" was welcomed in a huge way. The real kicker here? This is the set-up to a larger production and it does its job perfectly. I personally look forward to seing the bigger story unravel. I can't wait actually. Director Shiva Rodriguez sets out to entertain... and entertained I was. "Coming Home" could be the start of an exceptional story. I can't wait to see how it all turns out." - Comment from a review on IndyRed. See the full review. "Still, there's something special working in Coming Home and it will be interesting to see where it's taken from here. It feels like the foundation is established for a creative, compelling indie horror story and I look forward to watching the film's journey." - Comment from Richard Propes of The Independent Critic. See the full review. "Coming Home" is a solid, thoroughly entertaining, self-contained story. The acting, lighting, writing, pacing, and effects were all convincing. This film inspires an amount of intrigue that most shorts really can't manage, and subverts expectations (edited spoiler) effectively. In less deft hands, "Coming Home" would have been a disaster. However, you managed to craft an engaging, interesting, and successful thriller. Bravo!" - Comments from the festival directors of The Global Grit Film Festival. "All things considered, for the fact this is a prelude short, it would be nice to have it re-filmed one day, fleshed out and made brutally to stun people, because, full upwards thumbs in a line to Shiva Rodriguez. She is fluid at capturing emotions on film. What I mean is, it's the cutaways, the suggestion and aftermath. It's the angles, the expressions, and the really doom laden build up to the conclusion. She's bloody good at what she does." "There is minimal gore and it is appropriate for the scenes. Nothing gratuitous or unnecessarily over-the-top. For an independent project, the editing and other technical aspects are on par with studio productions." -Comment from Rick's Cutting Room. See the full review.